Linda Marzulla, the manager of EMC Brooklyn, counsels her pregnant clients to keep their babies, rather than abort them. 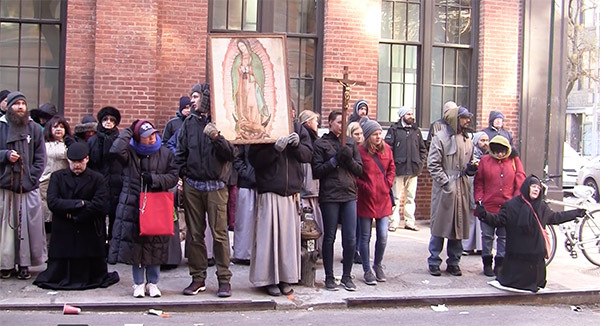 EMC Crisis Pregnancy Centers are at the heart of a controversial bill passed by the New York City council on March 2, which would require them to tell all potential clients that they do not refer for or provide abortion services. Photo by Jessica Bell. On the top floor of 44 Court St. in downtown Brooklyn, girls cheerfully walk in and out of Expectant Mother Care (EMC) Crisis Pregnancy Center. 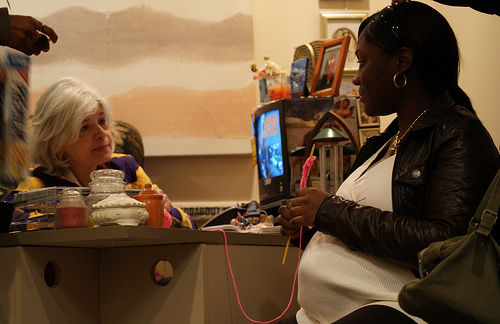 In the waiting room young women, all African American, knit and chat about their pregnancies while waiting for their appointments. Pictures of babies cut from newspapers and magazines line the walls of the medical consultation room and a National Geographic DVD plays in the background, outlining the development of a fetus from conception to birth. Yet what sets EMC apart from organizations like Planned Parenthood, which also provides services like pregnancy tests and ultrasounds, is that it is staunchly anti-abortion. EMC and other pregnancy services centers like it have become the focus of a controversial piece of legislation passed March 2 by the New York City Council. Sparked by the findings of a NARAL Pro-Choice New York two-year investigation of crisis pregnancy centers (CPCs), it claims CPCs use deceptive advertising practices to entice women to come into their centers—scare tactics that convince women to carry unplanned pregnancies to term. The legislation would require centers like EMC to be clear about what they offer. They would be forced to tell potential clients that they do not provide abortions. They would also have to tell clients whether or not they provide or refer for prenatal care, emergency contraception or abortions and whether or not they have a doctor on site. The legislation forces CPCs to include these disclaimers in all advertising and in all phone calls seeking information. The city council’s goal for the bill is to ensure that, when women of New York first walk into a crisis pregnancy center, they know what they’re getting themselves into. The Department of Consumer Affairs will regulate the law with punishments ranging from $200 fines to forced closure for five days. 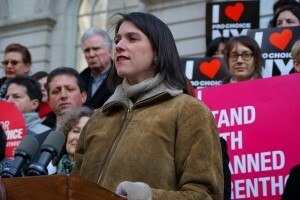 New York City council member Jessica Lappin defended Intro Bill 371 on the steps of City Hall March 2. The bill, authored by Lappin, would require crisis pregnancy centers to inform all potential clients that they do not refer or provide abortion services. Photo by Jessica Bell. EMC founder and president, Chris Slattery, and other anti-abortion activists claim this law infringes on their right to free speech. Slattery intends to sue the city, citing the first amendment and claiming that his centers will no longer be able to do their work. Slattery and the people he works with at his centers insist that they are not deceptive. He claims that the democratic led city council is just trying to push an abortion rights agenda. Linda Marzulla runs the EMC center in Brooklyn. She says that her center does not operate under false pretenses. They have a doctor on site on Mondays and Tuesdays, the days they run their prenatal care services. Also, they have a certified ultrasound technician on staff full-time. Yet unlike Planned Parenthood— which only shows expectant mothers an ultrasound image upon request—Marzulla said EMC shows all patients ultrasound images, whether or not they ask for it. This tactic is one that NARAL Pro-Choice New York and Lappin claim is manipulative, playing with the emotions of women with a tough decision to make. Marzulla said the mission of their center is to help the low-income patients they see daily. EMC claims it offers assistance with job searching, GED prep and temporary housing. But they refer all of these services out; none are actually provided directly by EMC. One couple at the center, Anthony Tucker, 47, from Coney Island, and Selma Ramsey, 43, decided to keep their baby after talking with Marzulla about their options. Ramsey is nine months pregnant with the couple’s third child. Tucker lives a transient lifestyle. He said he is unemployed and always on the move, while Ramsey lives in a Fort Greene homeless shelter. When the couple first came to EMC, they worried about their ability to take care of the child once it was born. Both Tucker and Ramsey said that while they were encouraged to choose parenting, but they did not feel any pressure to keep their baby. “I thought about it and said you know when you’re right. It’s not fair to the child. It’s just not fair, everyone should have the chance to live,” Tucker said. Ramsey said she came to EMC because she saw one of the ads. EMC has helped Tucker search for a job and two volunteers purchased clothing and baby supplies for Ramsey. But when asked if they help women who come to their centers and still decide to terminate their pregnancy, the answer was no. This division between which patients CPCs will help and which they won’t is what makes them deceptive in the eyes of many abortion rights activists. Lappin and Speaker Quinn insist that this bill will not infringe on free speech and is essential to protecting the women of New York. “We can’t stop them from saying whatever they want to say but at least we can make sure that they do it in a way that is not deceiving anybody.” Lappin said. We knew your report would be pro-choice friendly. Your photographs of the center portrayed us as low income African-Americans. Even your photograph of Linda and one of the expectant mothers; you made them appear to be less than accurate. Is that why you held the camera so high up to make Linda look small and tired? The girls are all disappointed of your depiction of us! It is obvious that your article is bias to pro-choice. You depict EMC as the enemy when it is people like you who are really the ones who are dangerous. You come into their centers with the sole purpose to degrade and defame their true character. There is no false pretense in these crisis pregnacy centers. They are up front and honest. They do what they do for the sole purpose to help a fellow human being. 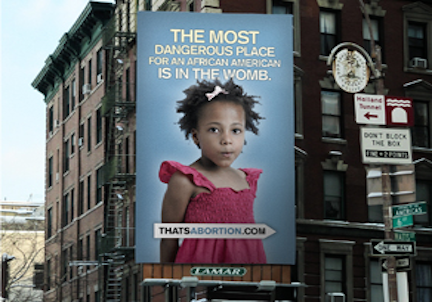 It is the abortion clinics who make millions in this industry. Places like EMC do not make any money on these girls so you tell me who is deceiving who? If there were more places like EMC in the world it would truly be a better place. Great article. I agree that these ladies should get all the help they can. Leave them alone.